Today I wanted to share with you another field report regarding a troubleshooting case I’ve had with Exchange 2010. 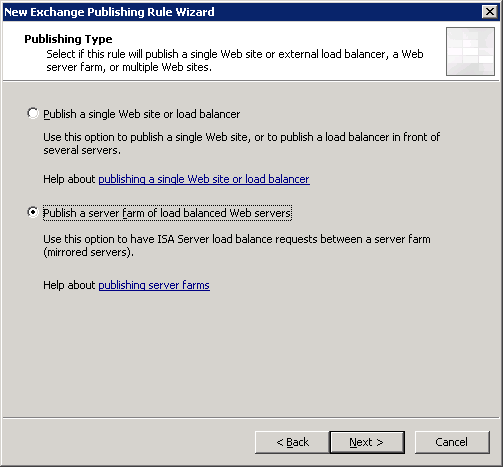 A while back in 2009 I’ve re-posted a blog post from the Exchange Team Blog- Troubleshooting Exchange 2003 and 2007 Store Log/Database growth issues – it included a link to Mike Lagase‘s blog and massive troubleshooting guide on this matter. This week I’ve been called to help with an Exchange server 2010 that was creating tremendous amounts of log files for a specific database, with regards to the blog post I’ve mentioned, ExMon – Exchange Server User Monitor came to the rescue, real fast. Fired it up with an interval of 15 minutes, and located the user that is responsible for the issue, note the screen shot, sorting by “Log Bytes” the top user created 800 MB in 15 minutes !! From this point forward it was easy to solve this issue, disabling both MAPI And Active Sync feature for the user, and detected the cause. 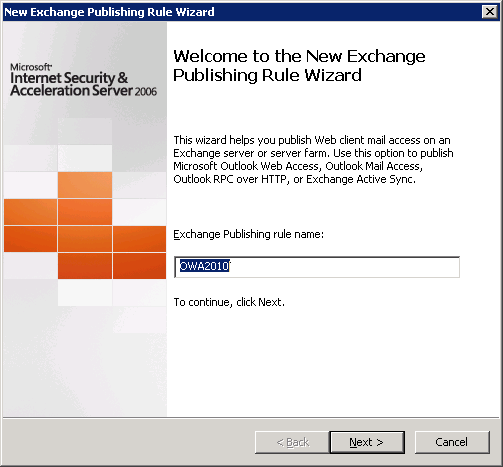 The current “Best Practice” is to upgrade your Exchange Server to Service Pack 2 and apply Update Rollup 3 for Exchange Server 2010 Service Pack 2 (KB2685289), as this issue has been permanently solved. See Synchronization of an organizational forms library fails when you use Outlook in Cache mode in an Exchange Server 2010 for additional information. 11:56:54 The client operation failed. Notice: Use this method at your own risk ! This method is for organizations that do not use Forms ! 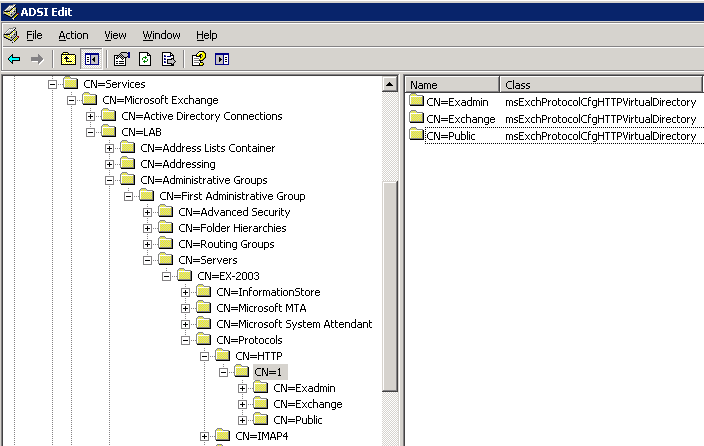 Many posts and different resolutions were recommended, my original “fix” for this issue was to not replicate the organizational forms folder to the new Exchange 2010 public folder when starting to De-commission the Exchange 2003 server, practically “leaving it behind”. 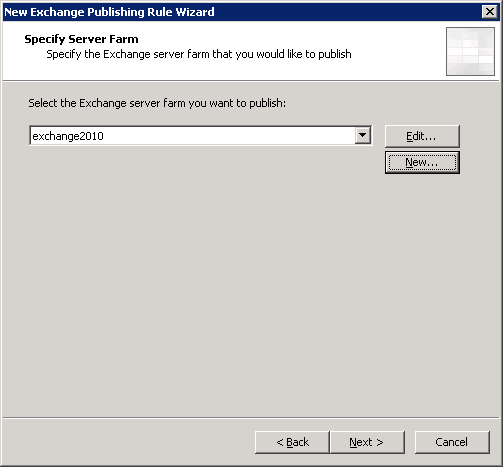 I recently handled a situation where the Exchange 2003 server was already removed, and the forms folder was already replicated to Exchange 2010, and the error was already in place. 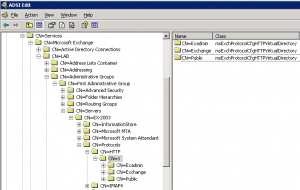 I could not use Exchange 2003 System Manager to remove the replica, Exchange Management Shell or EXFolders. You cannot really leave an empty replica list within the tools. Open MFCMapi, click the session menu, select the logon and display store table option. Double click public folders, expend the public root tree, expend NON_IPM_SUBTREE, expand EFORMS REGISTRY. Locate and select the organizational forms folder. Scroll the property list to find the PR_REPLICA_LIST entry – double click it and clear the value inside – clear means delete the values inside the property. Setting PR_REPLICA_LIST to NULL actually leaves us with an empty replica list – which “solves” this issue. Exit Outlook, wait and see that indeed the Sync Issues folder does not include a new log with the 80004005-501-4B9-560 error. Use this method at your own risk ! and again – this method is for organizations that do not use Forms ! This came up with a request to “fake” exchange server names, which are actually old DE-commissioned servers. users are using RPC over HTTP , and the exchange profile they use had those server names as the actual mailbox server. 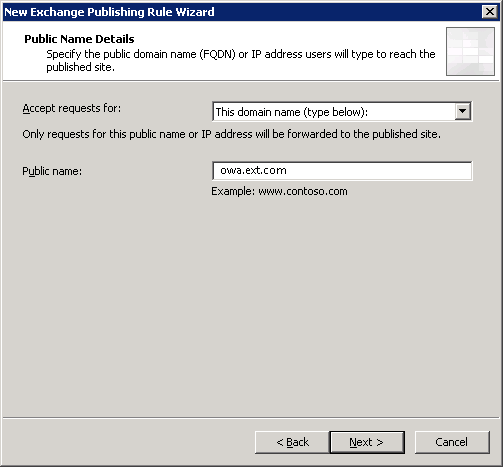 This issue might show up when performing cross forest migration or removing servers, while manipulating name resolving using DNS CNAME records, etc..
With Exchange 2010 and Exchange 2007 Outlook Anywhere settings are applied automatically when you enable the outlook anywhere feature on a CAS server, proxy names in the registry ( HKEY_LOCAL_MACHINESOFTWAREMicrosoftRpcRpcProxy) are automatically entered, that is all back-end servers that were enabled for RPC over HTTP (2003) and all mailbox servers 2007 / 2010. 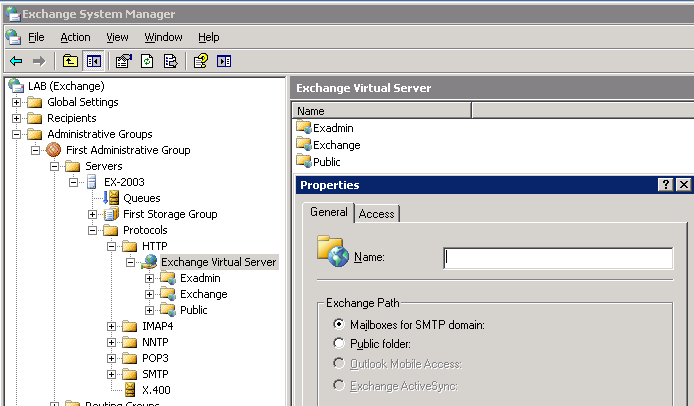 So by default RpcProxy will only answer for existing mailbox servers, we want to add our own “old” , “fake” exchange server names. 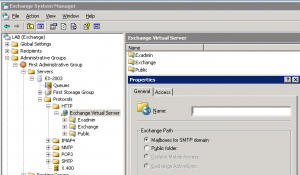 Here’s how to manipulate the RpcProxy entry in the Exchange server make it stick. Configure the “fake” names, for example “email2.fake.com” will be the fake mailbox server we will add. Now configure outlook to use the email2.fake.com server and configure Outlook Anywhere to verify it works. 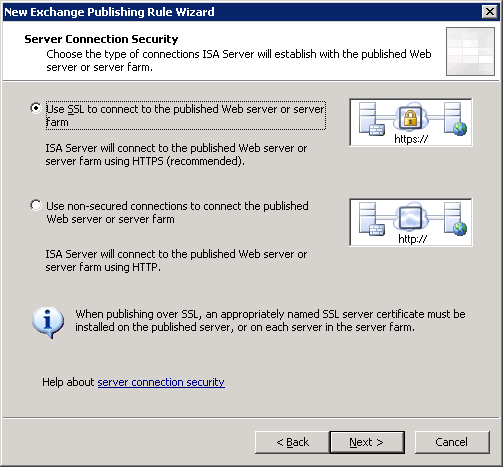 This guide will not cover scenarios when exchange is directly exposed to the internet. which I personally do not recommend in generally…. – The publishing rule for the Web Farm is now complete. Remove the legacy virtual directory’s – /Exchange, /Exchweb and /Public they will continue to be published to your original 2003 rule. 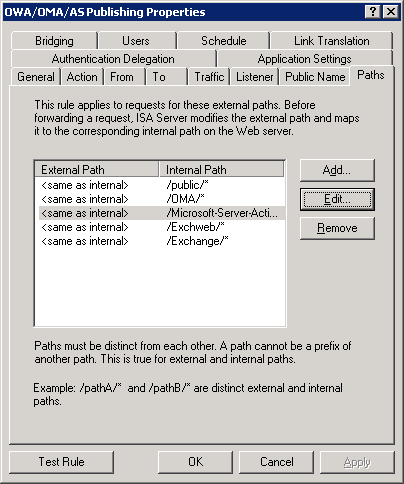 Add /ecp/* as this is the new “options” applications for users, and a powerful administration web console with Exchange 2010. 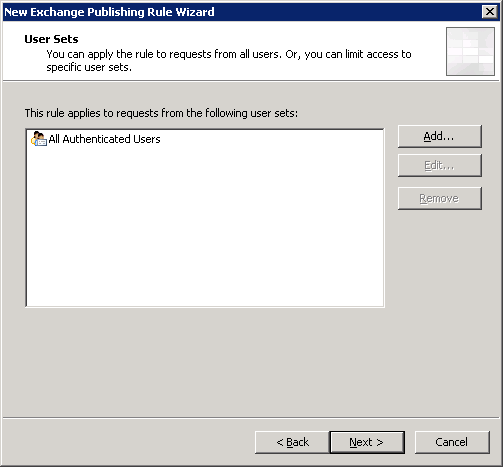 Edit the original OWA 2003 publishing rule and remove Microsoft-Server-ActiveSync path, we will next create ActiveSync publishing rule for Exchange 2010. 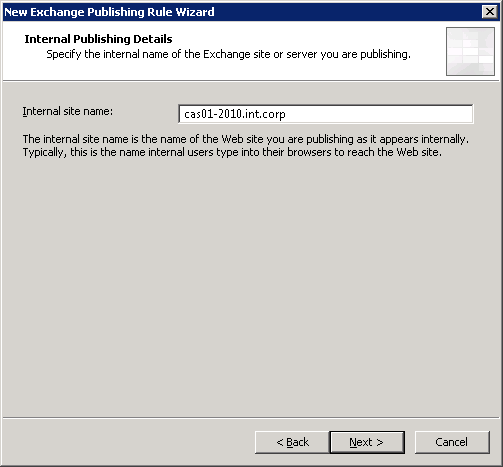 Create a new Exchange Web Client Access rule – and select ActiveSync – Repeat most of part 1 except we select ActiveSync, publish the webfarm, enter the same info, and select the same listener. 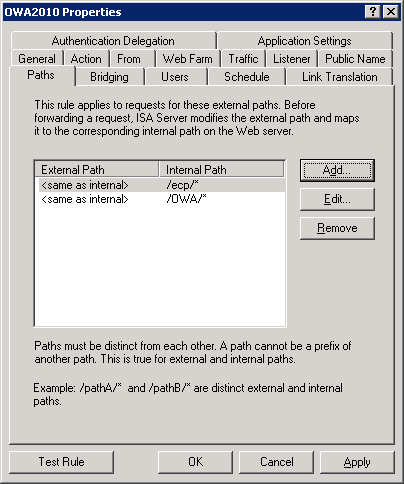 Now as same for ActiveSync, we need to move the RPCoverHTTP (Outlook Anywhere) from the 2003 publishing rule to 2010 publishing rule. Delete the existing rule. 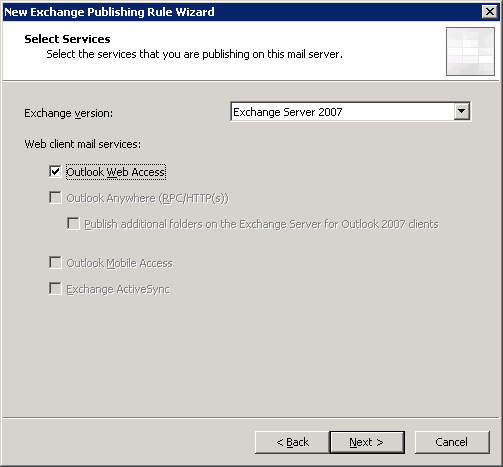 Next you we will create a new publishing rule for Outlook Anywhere based on Exchange 2010. 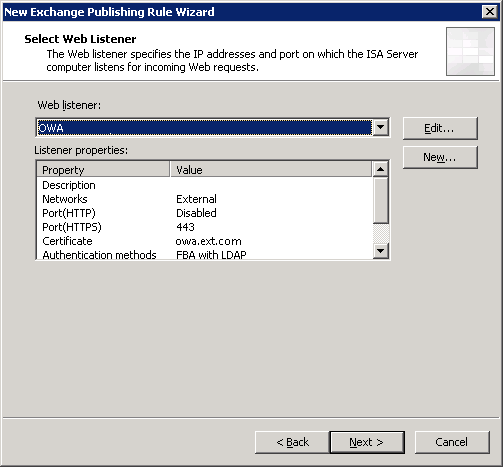 Create a new Exchange Web Client Access rule – and select Outlook Anywhere – Repeat most of part 1 except we select Outlook Anywhere, publish the webfarm, enter the same info, and select the same listener. 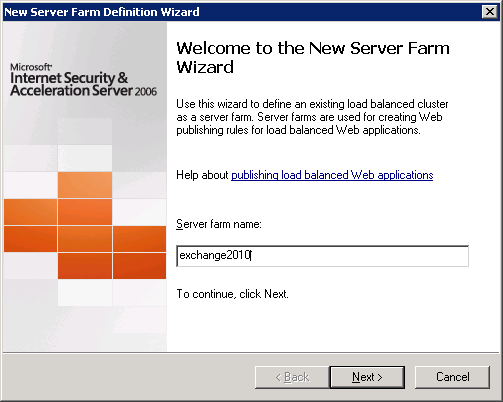 if you kept up with all the requirements, all should be fine and you are now able to migrate your 2003 users to 2010 with ease, while both systems are allowed for external connectivity. Outlook 2007 + Plain Text replies , that uses Right to Left languages , in my case Hebrew, were received reversed in order .. that is the words in the sentences were displayed literally reversed. A quite annoying word issue actually… A workaround for this was making sure that users were sending out Rich Text (RTF) email’s. then the replies were displayed correctly. This solved my issue on the spot. Recently, I’ve did some troubleshooting with Fortinet and ActiveSync timeout, also known as Event ID 3030 Source: Server ActiveSync with the following being output to the Application Log on an Exchange Server 2003 and 2007. The average of the most recent  heartbeat intervals used by clients is less than or equal to . Make sure that your firewall configuration is set to work correctly with Exchange ActiveSync and direct push technology. 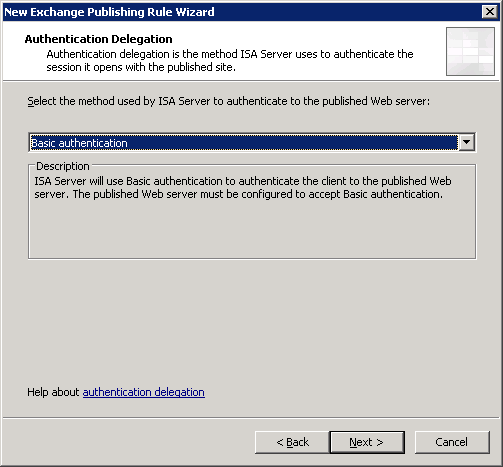 Specifically, make sure that your firewall is configured so that requests to Exchange ActiveSync do not expire before they have the opportunity to be processed. Read more on the Direct Push in Technet : Understanding Direct Push , typically you will need to adjust your session TTL to no less then 12 minutes. 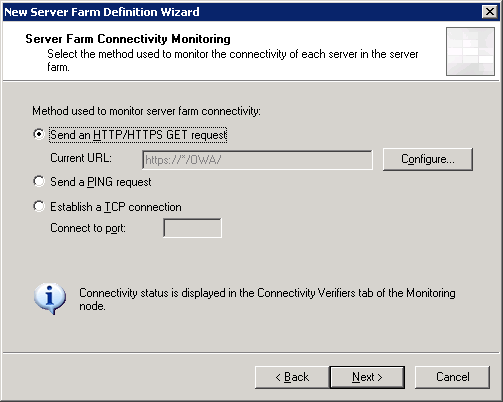 Fortinet lists the official help on the subject in http://kb.fortinet.com/kb/microsites/microsite.do?cmd=displayKC&externalId=FD31862 – FD31862	– Customizing Session TTL in FortiOS 4.0 , FortiOS 4 also allows this in Per rule ! so for all those with FortiOS 3 , use the mentioned KB from Fortinet try the FortiOS CLI Reference..
Issues like these always come up with various customers, I’d thought it might be good to share with you all. This is one of the most comprehensive collection of information on how to troubleshot those issues. Read it !